When something is ‘vaste prik’ in Dutch it means that something happens with a certain regularity, or something happens so often and regularly that it has become a certainty. The phrase is also used in the form ‘[subject/topic] is vaste prik’. The phrase apparently dates back to the practice of tax collectors to carry a stick that they punctured or made small cuts in to help them determine the amount of tax paid (as a counting aid). Such a stick is called ‘kerfstok’ in Dutch (for which I can’t find a translation). – Prik: prick, prod, injection/inoculation [noun] [de prik, de prikken]. ‘Prik’ is also the Dutch word for ‘pop/fizz’. – Prikken: to prod/puncture/pin, to inject/inoculate, to set/fix a date [verb] [prikte, geprikt]. – Zeker: certain, absolute(ly) [adjective/adverb]. 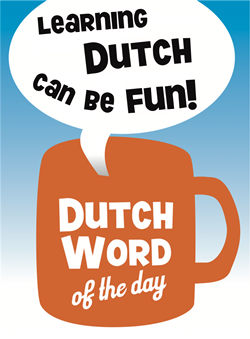 This entry was posted in Dutch phrase of the week, DWOTD 1.0, Vocabulary Intermediate and tagged dat is vaste prik, datum prikken, prik, prikken, regelmatig, vast by Sander. Bookmark the permalink. I guess. Tallying is what you talk about, notching a stick/counting with, tallying.